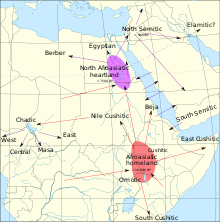 One proposal of possible expansion routes of Afroasiatic languages from the Horn of Africa. The Proto–Afroasiatic language, also known as simply PAA; is the reconstructed proto-language from which all modern Afroasiatic languages are descended. Though estimations vary widely, it is believed by scholars to have been spoken as a single language around 12,000 to 18,000 years ago. As Afroasiatic is the oldest established language family in the world, the reconstruction of Proto-Afroasiatic is problematic and remains largely lacking. Moreover, there is no consensus as to where the Afroasiatic Urheimat, the homeland of Proto-Afroasiatic speakers, was located. Proto-Afroasiatic was believed to be a Nominative-Absolutive ("Marked nominative") language; due to most Afro-Asiatic languages evidently marking the Nominative case; while leaving the Object case to be unmarked (Absolutive). It's syntax possibly featured an exclusively default, strict word ordering of VSO. Although, latter Afro-Asiatic descended languages may have evolved areal or (variable) free word order. It is generally surmised that PAA was originally a VO language. Reconstructed words for fauna and flora and evidence of linguistic contact with language families known to have been spoken in Eurasia suggest that its home was in the Middle East, probably the Levant. Some geneticists and archaeologists have argued for a back migration of proto-Afroasiatic speakers from Western Asia to Africa as early as the 10th millennium BC. They suggest the Natufian culture might have spoken a proto-Afroasian language just prior to its disintegration into sub-languages. The hypothesis is supported by the Afroasiatic terms for early livestock and crops in both Anatolia and Iran. Evidence of Cushitic being formerly spoken in the south of Arabia also speaks for a Middle Eastern origin, but some proposals also claim Northern Africa or the Horn of Africa. The following table shows consonant correspondences in Afroasiatic languages, as given in Dolgopolsky (1999), along with some reconstructed consonants for Proto-Afroasiatic. *χ  *χ ḫ, ẖ, ħ *H- *h-, *-Ø- *-H-? *w *w w-, j, y *w, *Ø *w, *Ø *w-? Symbols with dots underneath are emphatic consonants (variously glottalized, ejective or pharyngealized). Transcription of Ancient Egyptian follows Allen (2000); see Transliteration of Ancient Egyptian. The following are possible values for the non-IPA symbols used for Ancient Egyptian: ẖ = [ç]; ṯ = [tʲ] or [t͡ʃ]; ḏ = [dʲ] or [d͡ʒ], or ejective [tʲʼ] or [t͡ʃʼ]. "six": Egyptian srs, Proto-Semitic *šidṯ-, Berber (Tamazight) sdˁis. "seven": Egyptian sfḫ, Proto-Semitic *šabʕ-, Berber (Tamazight) sa. ^ Blench, Roger. (2006). Archaeology, Language, and the African Past. Rowman: Altamira. ISBN 9780759104662. ^ Blažek, Václav. "Afro-Asiatic linguistic migrations: linguistic evidence" (PDF). ^ Dolgopolsky (1999), pp. 38-39. ^ Prasse (2000), p. 346. Ehret, Christopher (1995). Reconstructing Proto-Afroasiatic (Proto-Afrasian): vowels, tone, consonants, and vocabulary. University of California Press. ISBN 0-520-09799-8. Prasse, Karl G. (2000). Études berbères et chamito-sémitiques: mélanges offerts à Karl-G. Prasse. Diakonoff, Igor M. (1988). Afrasian Languages. Moscow: Nauka. Takács, Gabór (1999). Etymological Dictionary of Egyptian. Leiden, Boston, Köln: Brill. ISBN 90-04-11538-2. Orel, Vladimir & Olga Stolbova (1995). Hamito-Semitic Etymological Dictionary. Leiden, Boston, Köln: Brill. ISBN 90-04-10051-2. Dolgopolsky, Aharon (1998). The Nostratic Macrofamily and Linguistic Paleontology. Cambridge: McDonald Instutite for Archaeological Research. ISBN 0-9519420-7-7. Bomhard, Allan R. (2008). "A Sketch of Proto-Afrasian Phonology", Ed. G. Takács, Semito-Hamitic Festschrift for A. B. Dolgopolsky and H. Jungraithmayr, Berlin: Dietrich Reimer Verlag, pp. 79–92.